I can pretty much assure you that there was nothing positive about the mental impact it had. It's not anywhere near as effective as a friendly chat with someone you get along with. No hard feelings, just consider this a friendly chat about neg repping. You can have that conversation without the neg rep. Giving neg reps isn't cool. I don't ever give neg rep.
What's my man Charles up to now? Haven't heard. Yeah, I'd love to spread his good works around the Tulsa meetup and here. Let's have that link! Repost it to your heart's desire. Come join us as we rally for liberty with Tom Woods, Jordan Page, and Jason Rink! Let’s celebrate our growth and success in 2012, and get pumped about taking this movement to the Oklahoma GOP State Convention! As the Republican field sets its sights on New Hampshire, one of the candidates is looking forward to the Oklahoma primary. 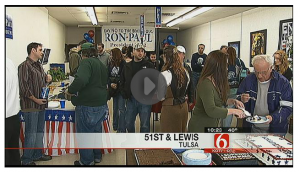 It’s not until March 6th, but Ron Paul is already planting roots in Tulsa. Current Conditions or Just a Bad Dream? Could it all be a bad dream or a nightmare? Is it my imagination or have we lost our minds? It is just not believable. A delusion of momentous proportions. Based on preposterous notions and on ideas whose time should never have come. Simplicity grossly distorted and complicated. Insanity passed off as logic. Arresting a middle-aged writer in an evening gown for peaceable conduct is a far cry from when America was a free republic. Read Naomi Wolf's report of her arrest at Occupy Wall Street about the 'closing civil society' where we live.